There will be a few readers who experienced the 1970s themselves – or from a close range, like myself (1977) – and there will also be a readers that know the 1970s best from ‘That ’70s show’. The first group probably don’t know about ‘That ’70s Show’ at all. The 1970s was an era of continued NASA Apollo launches, super jets, orange curtains, quartz LED watches and crazy super sports car designs as the Lambo Miura, Maserati Boomerang, Mercedes CW311 and so on. Anyway, growing up in the 1970s, MB&F owner Max Büsser was surrounded by super cars like the Lambo Miura which made him dream to become a car designer one day. Things ended up a bit differently and he became one of the best known and respected watch designers at the start of the new millennium. For what it is worth, here at Fratellowatches we think he would be able to create a hell of a super sports car anyway. Clearly inspired by the era in which he grew up, Max Büsser & Friends proudly presents the Horological Machine No 5. The case has been inspired by the Amida Digitrend from 1976, one of the few brands that didn’t find piece in quartz but tried to fight back to these hideous battery operated plastic pieces. An interesting historical overview on the Amida Digitrend – for those who not know – can be found here. 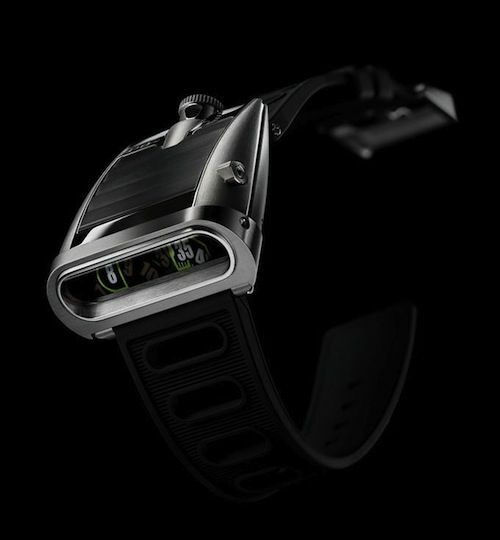 Just like the Amida Digitrend, the MB&F HM No5 has jump hours that are being shown through a sapphire crystal reflective prism that will bend the light 90 degrees as well as to magnify the numerals by 20%. You wouldn’t say you are looking at rotating discs on top of the movement, would you? The dial has been entirely covered in Super Luminova and afterwards everything has been masked except for the 8mm large numerals. 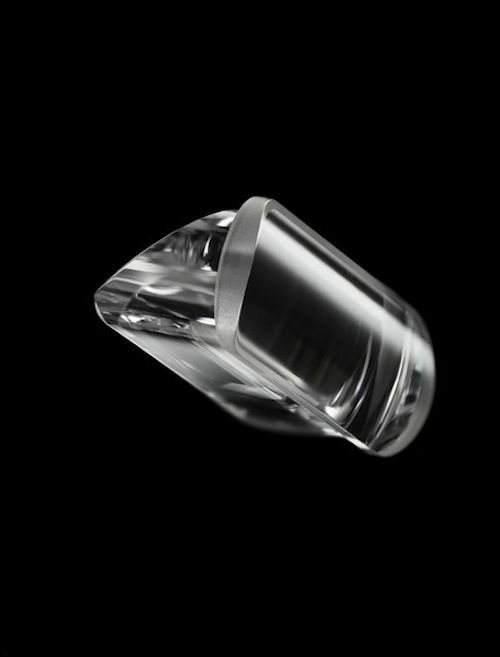 The sapphire prism is wedge-shaped with the angles precisely calculated to ensure that light is reflected from the horizontal indications to the vertical rather than refracted (bent). A convex lens at the front provides the magnification. Sapphire crystal is much more difficult to work to optical precision than glass and it took considerable development and meticulous care in production to create crystals that reflected and bent light without the slightest distortion. Watch makers – or engineers – Jean-François Mojon, Vincent Boucard and their team at Chronode developed the HM5 Engine/complication. They created the bi-directional jumping hours, which enables the owner to correct the time either forwards or backwards. 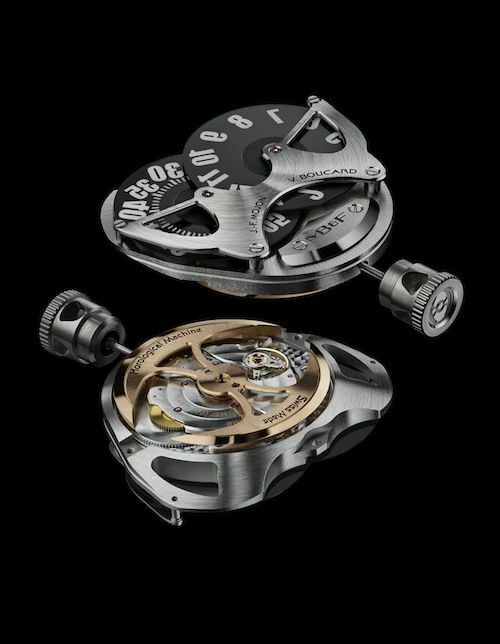 As you can see below, the movement has a very wide bridge to which the hour and minute wheels are connected, to be able to have a lot of overlap on the big discs to maximize space and the size of the numerals. This gave the best results on the ‘digital dashboard’ of the HM No5. 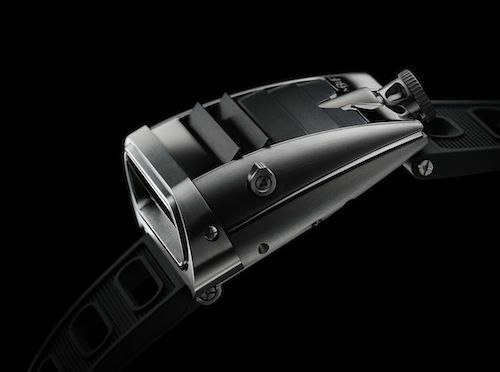 The back of the movement has the 22K gold heavy weight mass for optimal operation. The mass is shaped like a battle-axe. Through the sapphire case back of the watch, something the Amida was lacking, you’re able to see the beautifully hand finished movement. 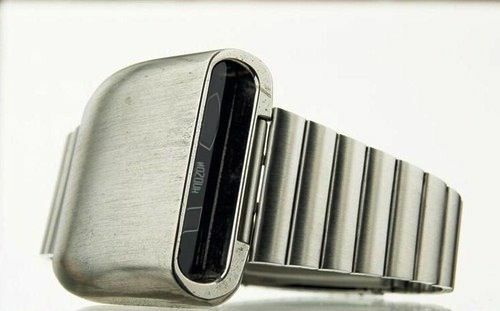 The Zirconium case measures 51.5 x 49 x 22.5mm, which makes us wonder how this super sports watch with 1970s influences will wear on the wrist. 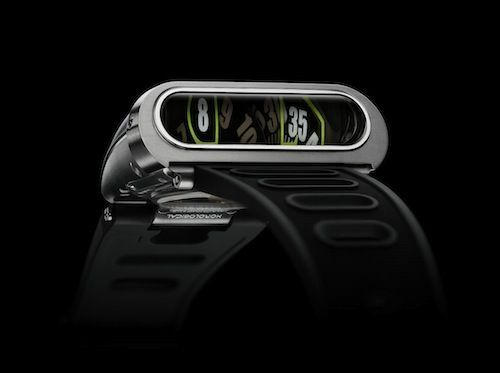 One thing is certain though, this CHF 54,000.- Horological Machine is yet another super cool designed and engineered time piece from watch design legend in the NOW, Max Büsser. Can’t wait to try it on. 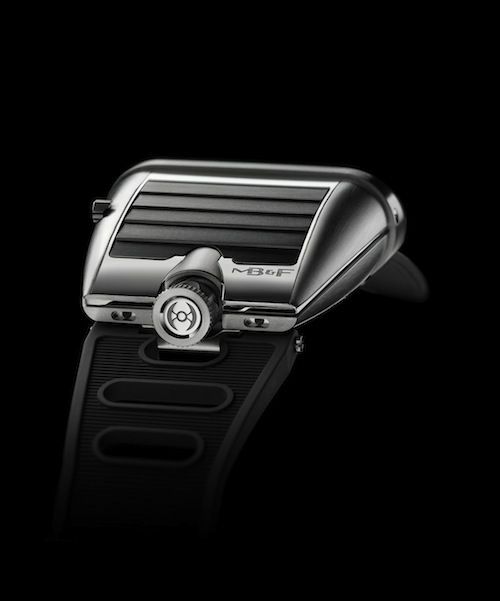 More information can be found at the official MB&F website or on their Facebook page.